There was a time when Banksy murals popped up all over London with monotonous regularity. But now their value is known. A stencil by the guerrilla street artist which appeared just before the Queen’s Diamond Jubilee has disappeared from a wall in North London and is being auctioned in Miami for £450,000. 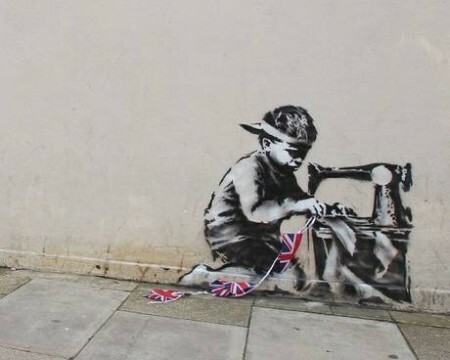 The mural, painted on the side of a Poundland in Turnpike Lane in May last year, shows a small boy sewing Union Jack bunting, and was interpreted as a comment on child labour. ouncillors failed to discover how it was stolen, and would like it back. Fat chance. One says ‘Banksy gave the piece of art to our community, and people came from all over London to see it.’ Funny, then, that just a short while ago councils were still painting over them. Clearly somebody recognised its value, ripped it off and took it to America. As Banksy’s go, it’s not that attractive, but I’d love to know how you get a mural off a wall in one piece, then smuggle it through the US’s notoriously severe customs services. You and me both, Admin. Can I assume the paving and the bunting are real? Or are they part of a trompe l’oreal? It’s hard to tell from the photo. The paving and the bunting are/were real. Stealing a mural is easy, it just takes a little adjustment of mindset, Think Lord Elgin. As it surfaced in Miami would it be too much of a stretch to think it might have gone via Mexico? [I’ll find some better pictures and post a link]. In the article linked above it states that the mural is still in Europe. Taking it off would depend on both the substratum (always wanted to use a word like that) and the medium used. Taking acrylic off an enamel painted surface might be easy, water based paint off unfinished wood, not so much. How on earth they can say ‘all was above board’ according to the auction site beggars belief. Unless Banksy & Poundland are selling it (and Poundland have stated they are not) . . .it is public art and has been stolen.